USMLE Step 1 Pro is a High Yield USMLE Step 1 Flashcards app basedon the First Aid book that uses the principle of Spaced Repetitionto help students retain large amount of medical knowledge in theirlong term memory. Best USMLE Review App EVER from the Highest YieldReview Material!This Pro Version of the App contains 9,631Flashcards from High Yield topics, structured in a similar fashionto the most popular USMLE Review Book: First Aid. All TopicsCovered by This App: BehavioralScienceBiochemistryMicrobiologyImmunologyPathologyPharmacologyCardiovascularEndocrineGastrointestinalHematology&OncologyMusculoskeletalNeurologyPsychiatryRenalReproductiveRespiratoryRapidReviewEach section also contains all its relevant mnemonics,anatomy, physiology, embryology, histology, pathophysiology,pathomorphology, pharmacology and more. How to use our app:Ourreview method is to help you retain all the material you read for avery long time. As soon as you open a card, a timestamp will beadded to that card. Using this time as a reference you will berequired to review the card again a day later, a week later(7 days)and a month later(4 weeks or 28 days later). If you review the cardagain at the appropriate spaced review time you will get a ✓. Ifyou miss the timeframe allowed to review the card, you will get a✘. Your score will be based on whether you hit your spaced reviewgoals or not.Icon Meanings:(···) Awaiting = Card is not yet openfor review but will open in the future for review. (O) Open = Thiscard is open to be reviewed NOW. (✘) Missed = You missed the 24hrtimeframe to review this card. (✓) Done = You successfully reviewedthe card within the open timeframe. What is SpacedRepetition?Spaced repetition is a learning method that requiresincreasing intervals of time between periodic reviews of previouslylearned material in order to exploit the psychological spacingeffect. Spaced repetition is commonly applied in contexts where alearner must acquire a large amount of knowledge and retain itindefinitely in memory such as when studying for a board exam orlearning a second language. We have heavily researched manylearning studies done by famous authors such as Hermann Ebbinghaus,Sebastian Leitner(Leitner System), Paul Pimsleur, A.W. Melton,Thomas Landauer, Robert A. Bjork, C. A. Mace & H. F. Spitzerfrom which we extracted the best concepts to ultimately create thistechnology focused App. We built this proprietary piece oftechnology which keeps track of when a particular flashcard wasreviewed, prompts users to review it again 1 day later, a weeklater(7 days) & a month later(28 days so 4 weeks). Spacingreviews in this manner insures each flashcard will be learned atleast 4 times which almost guarantees the material will be retainedin the memory forever. Why learn in this manner? Well, the famousstudy on human memory done by German psychologist HermannEbbinghaus describes that within the first 24 hours of learning weforget 50% - 80% of what was learned and without further review, by30 days we remember merely 2% of the information. According toEbbinghaus, spaced repetition is the most important factor in orderto retain what was learned. Periodic reviews (every 24 hour, weekand month later) provide the needed spikes in memory to retainlarge amount of information as long term memory. 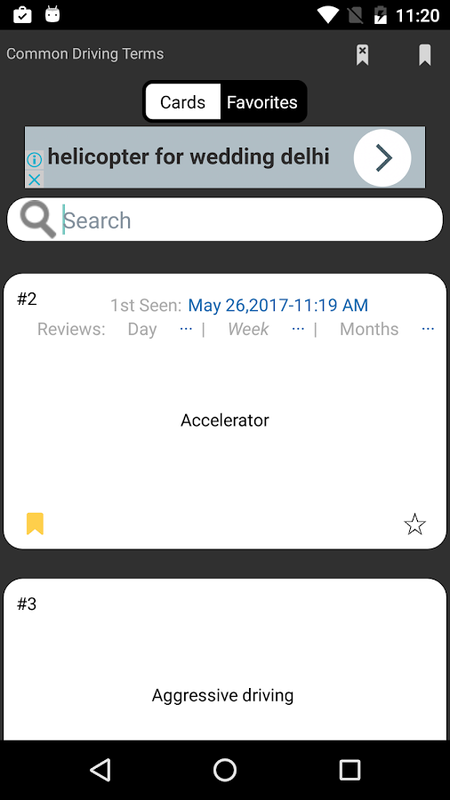 Awesome AppFeatures: ● Timestamp based flashcard tracking – Know exactly whenyou reviewed a particular flashcard. ● Support for all sizeddevices.● Spaced Review Score – Instant updating score system basedon spaced review target achieved or missed. ● Fast Navigationthrough Flashcards – Auto Bookmark, Favorite & Scroll through100s of flashcards with ease. ● Iconographic Review Reminders –Time based icon updates on every flashcard to remind users when toreview a particular card. USMLE Step 1 Flashcards LITE is a High Yield USMLE Step 1Flashcards app based on the First Aid Book that uses the principleof Spaced Repetition to help students retain large amount ofmedical knowledge in their long term memory. Best USMLE Review AppEVER!This Lite Version of the USMLE Step 1 Flashcards App containsonly the first 100 Flashcards from High Yield topics, structured ina similar fashion to the First Aid book. ***Upgrade to our USMLEStep 1 Flashcards Pro for a full index of all 10,000+Flashcards. ***All Topics Covered on This USMLE Step 1 FlashcardApp: Behavioral Science, Biochemistry, Microbiology, Immunology,Pathology, Pharmacology, Cardiovascular, Endocrine,Gastrointestinal, Hematology & Oncology, Musculoskeletal,Neurology, Psychiatry, Renal, Reproductive, Respiratory & RapidReview. How to use our app:Our review method is to help you retainall the material you read for a very long time. As soon as you opena flashcard, a timestamp will be added to that card. Using thistime as a reference you will be required to review the card again aday later, a week later(7 days) and a month later(4 weeks or 28days later). If you review the card again at the appropriate spacedreview time you will get a ✓. If you miss the timeframe allowed toreview the card, you will get a ✘. Your score will be based onwhether you hit your spaced review goals or not.Icon Meanings:(···)Awaiting = Card is not yet open for review but will open in thefuture for review. (O) Open = This card is open to be reviewedNOW. (✘) Missed = You missed the 24hr timeframe to review thiscard. (✓) Done = You successfully reviewed the card within the opentimeframe. What is Spaced Repetition?Spaced repetition is alearning method that requires increasing intervals of time betweenperiodic reviews of previously learned material in order to exploitthe psychological spacing effect. Spaced repetition is commonlyapplied in contexts where a learner must acquire a large amount ofknowledge and retain it indefinitely in memory such as whenstudying for a board exam or learning a second language. We haveheavily researched many learning studies done by famous authorssuch as Hermann Ebbinghaus, Sebastian Leitner(Leitner System), PaulPimsleur, A.W. Melton, Thomas Landauer, Robert A. Bjork, C. A. Mace& H. F. Spitzer from which we extracted the best concepts toultimately create this technology focused USMLE Step 1 App. Ourbrilliant team of developers built this proprietary piece oftechnology which keeps track of when a particular flashcard wasreviewed, prompts users to review it again 1 day later, a weeklater(7 days) & a month later(28 days so 4 weeks). Spacingreviews in this manner insures each flashcard will be learned atleast 4 times which almost guarantees the material will be retainedin the memory forever. Why learn in this manner? Well, the famousstudy on human memory done by German psychologist HermannEbbinghaus describes that within the first 24 hours of learning weforget 50% - 80% of what was learned and without further review, by30 days we remember merely 2% of the information. Based on theseresults, Ebbinghaus created his well-known Learning curve &Forgetting curve. According to Ebbinghaus, spaced repetition is themost important factor in order to retain what was learned. Periodicreviews (every 24 hour, week and month later) provide the neededspikes in memory to retain large amount of information as long termmemory. Awesome USMLE Step 1 Flashcards Features:● Timestamp basedflashcard tracking – Know exactly when you reviewed a particularflashcard. ● Support for all sized devices.● Spaced Review Score –Instant updating score system based on spaced review targetachieved or missed.● Fast Navigation through Flashcards – AutoBookmark, Favorite & Scroll through 100s of flashcards withease.● Iconographic Review Reminders – Time based icon updates onevery flashcard to remind when to review a card. Introducing the best Ambient Lounge Music Radio App with live up-tothe minute radio station streams from around the world. ThisAmbient Lounge Radio app has 500+ of the top "Always Live" radiostations arranged by the station’s uptime percentage so you alwaysget a "Live Radio Feed". We have also integrated a 1-Click YouTubesearch feature that lets you watch videos of any song that isplaying on live radio. This Ambient Lounge Radio app also shows youinformation about what song is currently playing on any particularradio stream & allows you to share radio station links withyour friends and family that will work on any mobile browserwithout having to download our App. This Ambient Lounge Radio Appalso allows you to search any radio stations by name. We haveworked very hard to build this beautiful Radio App with all thebest design practices which will provide you with the best userexperience & hours of entertainment. Awesome Ambient LoungeRadio Features: *Radio Stations aggregated from only the bestsources arranged by “Station’s Up-Time” percentage. *Music Stationswith the Highest Quality Stream. *1-click YouTube Search of anySong Playing on Live Radio. *Shows Each Station’s Category &Information about what Song or Content is currently playing. *Search Feature that will search locally within the category orability to search our website which has an index of 30,000+ RadioStations. *Easy sharable links that work on mobile browsers withouthaving to download the app. *Works Flawlessly in Background Mode. *Tablet compatible. *Best UI/UX practices. Introducing the best AOR Music Radio Stations App with live up-tothe minute radio station streams from around the world. This AORRadio app has 500+ of the top "Always Live" radio stations arrangedby the station’s uptime percentage so you always get a "Live RadioFeed". We have also integrated a 1-Click YouTube search featurethat lets you watch videos of any song that is playing on liveradio. This AOR Radio app also shows you information about whatsong is currently playing on any particular radio stream &allows you to share radio station links with your friends andfamily that will work on any mobile browser without having todownload our App. This AOR Radio App also allows you to search anyradio stations by name. We have worked very hard to build thisbeautiful Radio App with all the best design practices which willprovide you with the best user experience & hours ofentertainment. Awesome AOR Radio Features: *Radio Stationsaggregated from only the best sources arranged by “Station’sUp-Time” percentage. *Music Stations with the Highest QualityStream. *1-click YouTube Search of any Song Playing on Live Radio. *Shows Each Station’s Category & Information about what Song orContent is currently playing. *Search Feature that will searchlocally within the category or ability to search our website whichhas an index of 30,000+ Radio Stations. *Easy sharable links thatwork on mobile browsers without having to download the app. *WorksFlawlessly in Background Mode. *Tablet compatible. *Best UI/UXpractices. Introducing the best Reggaeton Music Radio App with live up-to theminute radio station streams from around the world. This ReggaetonMusic Radio app has 500+ of the top "Always Live" radio stationsarranged by the station’s uptime percentage so you always get a"Live Radio Feed". We have also integrated a 1-Click YouTube searchfeature that lets you watch videos of any song that is playing onlive radio. This Reggaeton Music Radio app also shows youinformation about what song is currently playing on any particularradio stream & allows you to share radio station links withyour friends and family that will work on any mobile browserwithout having to download our App. This Reggaeton Music Radio Appalso allows you to search any radio stations by name. We haveworked very hard to build this beautiful Radio App with all thebest design practices which will provide you with the best userexperience & hours of entertainment. Awesome Reggaeton MusicRadio App Features: *Radio Stations aggregated from only the bestsources arranged by “Station’s Up-Time” percentage. *Music Stationswith the Highest Quality Stream. *1-click YouTube Search of anySong Playing on Live Radio. *Shows Each Station’s Category &Information about what Song or Content is currently playing. *Search Feature that will search locally within the category orability to search our website which has an index of 30,000+ RadioStations. *Easy sharable links that work on mobile browsers withouthaving to download the app. *Works Flawlessly in Background Mode. *Tablet compatible. *Best UI/UX practices. Introducing the best Asian Music Radio Stations App with live up-tothe minute radio station streams from around the world. This apphas 500+ of the top "Always Live" radio stations arranged by thestation’s uptime percentage so you always get a "Live Radio Feed".We have also integrated a 1-Click YouTube search feature that letsyou watch videos of any song that is playing on live radio. Our appalso shows you information about what song is currently playing onany particular radio stream & allows you to share radio stationlinks with your friends and family that will work on any mobilebrowser without having to download our App. This Asian Music RadioApp also allows you to search any radio stations by name. We haveworked very hard to build this beautiful Radio App with all thebest design practices which will provide you with the best userexperience & hours of entertainment.Awesome Asian Music RadioFeatures: *Radio Stations aggregated from only the best sourcesarranged by “Station’s Up-Time” percentage. *Music Stations with theHighest Quality Stream. *1-click YouTube Search of any Song Playingon Live Radio. *Shows Each Station’s Category & Informationabout what Song or Content is currently playing. *Search Featurethat will search locally within the category or ability to searchour website which has an index of 30,000+ Radio Stations. *Easysharable links that work on mobile browsers without having todownload the app. *Works Flawlessly in Background Mode. *Tabletcompatible. *Best UI/UX practices. Introducing the best Comedy Radio App with live up-to the minuteradio station streams from around the world. This Comedy Radio apphas 500+ of the top "Always Live" radio stations arranged by thestation’s uptime percentage so you always get a "Live Radio Feed".We have also integrated a 1-Click YouTube search feature that letsyou watch videos of any song that is playing on live radio. ThisComedy Radio app also shows you information about what song iscurrently playing on any particular radio stream & allows youto share radio station links with your friends and family that willwork on any mobile browser without having to download our App. ThisComedy Radio App also allows you to search any radio stations byname. We have worked very hard to build this beautiful Radio Appwith all the best design practices which will provide you with thebest user experience & hours of entertainment. Awesome ComedyRadio Features: *Radio Stations aggregated from only the bestsources arranged by “Station’s Up-Time” percentage. *Music Stationswith the Highest Quality Stream. *1-click YouTube Search of anySong Playing on Live Radio. *Shows Each Station’s Category &Information about what Song or Content is currently playing. *Search Feature that will search locally within the category orability to search our website which has an index of 30,000+ RadioStations. *Easy sharable links that work on mobile browsers withouthaving to download the app. *Works Flawlessly in Background Mode. *Tablet compatible. *Best UI/UX practices. Introducing the best Children’s Music Radio App with live up-to theminute radio station streams from around the world. This Children’sMusic Radio app has 500+ of the top "Always Live" radio stationsarranged by the station’s uptime percentage so you always get a"Live Radio Feed". We have also integrated a 1-Click YouTube searchfeature that lets you watch videos of any song that is playing onlive radio. This Children’s Music Radio app also shows youinformation about what song is currently playing on any particularradio stream & allows you to share radio station links withyour friends and family that will work on any mobile browserwithout having to download our App. This Children’s Music Radio Appalso allows you to search any radio stations by name. We haveworked very hard to build this beautiful Radio App with all thebest design practices which will provide you with the best userexperience & hours of entertainment.Awesome Children’s MusicRadio Features: *Radio Stations aggregated from only the bestsources arranged by “Station’s Up-Time” percentage. *Music Stationswith the Highest Quality Stream. *1-click YouTube Search of any SongPlaying on Live Radio. *Shows Each Station’s Category &Information about what Song or Content is currently playing. *SearchFeature that will search locally within the category or ability tosearch our website which has an index of 30,000+ RadioStations. *Easy sharable links that work on mobile browsers withouthaving to download the app. *Works Flawlessly in Background Mode. *Tablet compatible. *Best UI/UX practices. CDL Test Prep offers the most advanced test system to your deviceoffering practice with over 360 up to-date questions. Don't takeany chances at the DMV. With CDL Test Prep, you'll be prepared. Theapplication is divided into the following sections: MOCK TEST Mocktest simulates the real test format. When you finish the test youwill see your score and review all the questions. PRACTICE BYTOPICS Test your knowledge by practicing by topics. DRIVER'SMANUALS You can download your state’s Driver's Manual to yourdevice anytime! The manuals are official DMV publications. PROGRESSMONITOR The application saves the result of each question answeredand a history of failures and successes to offer the most advancedsystem of all the statistics. APPLICATION FEATURES - Over 360questions. - Intelligent learning system: The questions areselected using an algorithm taking into account your latest scoresand the questions that you need to practice more. - Track andmonitor your progress. Analyse your performance and find out whenyou have reached test standard. - Modern and very easy to useinterface. Note: the DMV (Department of Motor Vehicles) is alsoknown in various states as the BMV, DDS, DOL, DOT, DPS, DVS, HSMV,MVD, MVDL, MVS, OMV, and RMV. Motorcycle Permit Test offers the most advanced test system to yourSmartphone or Tablet offering practice over 340 up to-date DMVquestions. With Motorcycle Permit Test, you'll be prepared! Theapplication is divided into the following sections: MOCK TEST Mocktest simulates the real test format. When you finish the test youwill see your score and review all the questions. PRACTICE BYTOPICS Test your knowledge by practicing by topics. DRIVER'SMANUALS You can download your state’s Driver's Manual to yourdevice anytime! The manuals are official DMV publications. PROGRESSMONITOR The application saves the result of each question answeredand a history of failures and successes to offer the most advancedsystem of all the statistics. APPLICATION FEATURES * Over 340questions. * Intelligent learning system: The questions areselected using an algorithm taking into account your latest scoresand the questions that you need to practice more. * Track andmonitor your progress. Analyse your performance and find out whenyou have reached test standard. * Modern and very easy to useinterface. If you enjoyed the app, please rate it and tell afriend! Don't take any chances at the DMV. With DMV Genie, you'll breezethrough your car, motorcycle or CDL written test. You'll besurprised how close the app is to the real thing! NO SURPRISES ATTHE DMV Get ready for your 2019 written permit test or driver'slicense test with unique questions written based on your state’sofficial driver’s handbook. Our users swear that most of thequestions are very similar (often identical) to those on the realtest. You’ll know exactly what to expect since our DMV practicetests have the same passing score as the actual test, too. WHY USEDMV GENIE? • Realistic: just like the actual car, motorcycle or CDLtest, our DMV practice tests are based on the official 2019 DMVmanual for your state • Smart hints: these help with trickyquestions and steer you in the right direction • Detailedexplanations: when you make a mistake, the app tells you straightaway if a question is wrong and why. There is a reference to theexact chapter in the handbook. You understand and remember everywrong answer • State-specific: unique questions for every U.S.state, the app works for every DMV, DDS, BMV, MVA, RMV, DOR, MVC,MVD, DOT, DOL in the country • Difficulty Levels: from Easy to Exam• Your personalized Challenge Bank to work on the most complicatedquestions across all car, motorcycle or CDL practice tests • Newquestions every time: to keep you on your toes, we randomizequestions and answers each time you restart a practice test •Review every question: learn from your mistakes • No registrationrequired • 1.01 Million downloads DRIVER'S MANUAL INCLUDED (ALL 50STATES) Download your state's official DMV Driver's manual from ourwebsite here: https://m.driving-tests.org/drivers-manual/ HOW TOUSE THIS APP MOST EFFECTIVELY There are several difficulty levelsyou can choose from. You can take the practice tests in anyparticular order, but most users go from Easy to Exam Mode. Thisway you won’t miss any of those tricky questions about speedlimits, Blood Alcohol Content or driving-related fines. Forbrushing up on a specific area of the Handbook you can practicetests specifically for road signs, road situations, and fines &speed limits. Visit your Challenge Bank (Hardest tab) to work onthe questions you've missed. WHAT IS THE EXAM MODE? As close as itgets to the actual DMV permit test or driver's license testexperience: • Same number of questions as the real thing • Stops assoon as you have reached passing or failing score • Skip as manyquestions as you like WHO IS THIS APP FOR? It's an effective,non-boring way to study for your written DMV test, especially ifyou're taking it for the first time. Select your vehicle and takeevery car, motorcycle or CDL practice test. This app has the samepractice tests that we have on our website(https://driving-tests.org) and is good for the learner's permittest, driver’s license test and the senior citizens’ refreshertest. The written part of those tests is the same. FUN FACTS: CADMV & CDL Around 25% of our users take the California tests fortheir CA DMV exam. Our CDL practice test is a close second. WANT TOTALK TO THE DEVELOPERS? To ask us a question, report a bug or aquestion-specific typo/mistake, go to Settings → Report a mistake.Email us directly at [email protected] We're always happy tohelp! Do not take any chance to fail in dmv driver test with our DMV Appyou are able to prepare DMV written test and get DMV permit easily.DMV App useful for learn Traffic Signs with information. You CanLearn All Traffic Signs & Traffic Signal with our app. In DMVDriver Test Categories like Road Signs with Traffic Signalsinformation. There are 4 types of Traffic Signs and Road Signs likeWarning Road Signs Guide Road Signs School Road Signs Regulatoryroad Signs all these road signs and traffic signs are available inDMV app free with all Traffic signs and Road signs Information forDrivers permit practice test. You can learn DMV Drivers permitPractice test at anywhere easily so you will easily pass yourdriving license test at your DMV place. All type of DMV writtentest available in this app you also mark favorite DMV Questions andTraffic Signs, Traffic Signals & Road Signs. You can show alsoNearby DMV Permit Spot so you can easily drive for Driver Licensetest. DMV permit App also reminds you to start learning DMVQuestions, Traffic Signals, Road Signs, and Traffic Signs with ourReminder feature. Drivers test questions are very useful for DMVTest and when you Driving Car. After you pass DMV Test as per yourState law you can apply Driving Test.